QC-CALC supporting software program has been created to enhance your data measurement and management processes, seamlessly collating all statistical data in one automatic operation. This Statistical Process Control (SPC) works by collecting, analysing and reporting data extracted from your CMM’s metrology process through base software packages such as MeasureMind 3D MultiSensor, Measure-X and ZONE3. OGP UK introduce this software program to ensure your data collection is seamless regardless of what measurement equipment you have in use or its accompanying software. But how does it work and what does it entail? QC-CALC Real-Time collects measurements and displays results automatically from all CMM’s without operator intervention, allowing the generation of reports alongside data exportation to other spreadsheets, databases and other SPC programs. This enables the user to transfer data from all active measurement processes and devices to a common statistical process control package using just one program. With over 200 supported machines, automatic database creation, true position plots, on-screen real-time readings, multisource QCC files, automatic reporting and exporting, trend detection and 21 CFR Part 11 compliance, meeting the FDA requirements for electronic records and signatures specific to automated data collection processes QC-Calc truly provides a complete solution. This is definitely the program to excel your current software’s data analysis capabilities. Offering smooth integration with automated gages is the foundation of QC-CALC Real-Time’s benefits and through elimination of human error in the data collection the user can sit back and watch as the software carries out all of the hard work automatically with speed and accuracy. 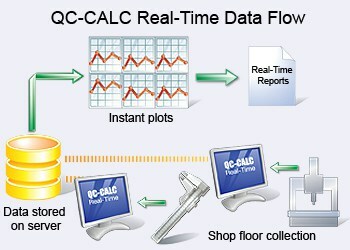 Whilst QC-CALC Real-Time enhances your reporting and exporting operations, QC-CALC SPC further extends your data analysis capabilities when it comes to report operations such as control charts, process charts, miscellaneous reports as well as providing data editing and filtering features, alongside FDA approved 21 CFR Part 11 compliance. 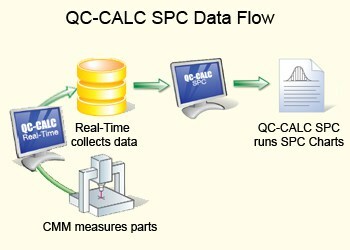 QC-CALC SPC is a complete statistical process control program that take the data collected by real-time software and analyses it, generating charts and reports that constantly monitor your measurement processes. Providing a wide range of charts and functions that allow the user to make informed choices and aid in the operator analysis, within seconds it gives you a precise analysis of your production line performance. This program ultimately allows the operator to group data from a multitude of sources, filter it, monitor the shop floor and run charts with only a few clicks. QC-CALC Real-Time collects readings of CMM and gage data, saving it to the network database allowing it to then use these readings. QC-CALC SPC then opens the same network database from any remote system in a location at the convenience of the user, allowing the data collection to be monitored and to determine product process efficiency. As the data readings are recorded, SPC plots are continuously updated to show live results straight from the shop floor. The archived data can then be filtered using a multitude of identifiers, which are stored at the time of measurement. QC-CALC Enterprise is the equivalent of QC-CALC Real-Time and QC-CALC SPC installed on the same computer allowing you to carry out thorough data analysis, enabling you to improve your production processes as well as monitor progression continuously. Designed for integration into any measurement process, QC-CALC is fundamentally an automatic software interface for all in-process and after process analysis, generating a database of nominal and tolerance data through your OGP SmartScope’s inspection routine.